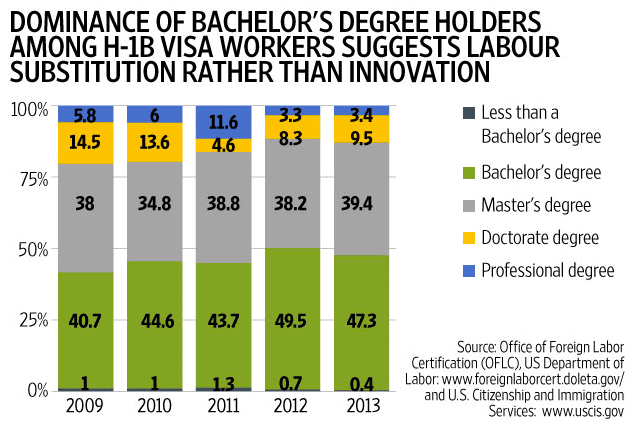 Has H-1B Visa become a medium for worker substitution? During his election campaign, Donald Trump announced his plans to bring back jobs as well as the protect the American business interests. He proposed major changes in the H1B Visa policy. The primary change would be to elevate the minimum wage from $60,000 to $130,000, thus creating a level playing field for the American workers. What is H-1B Visa exactly? H-1B is a non-immigration Visa in the USA. It comes under the Immigration and Nationality Act and it allows a foreigner with advanced degrees to be employed in America. The duration of the stay with H-1B visa is 3 years, and it is extendable up to 6 years. In recent years, it was being used to substitute American workers with people who were ready to work for a smaller wage. This defeated the purpose of the H-1B Visa which aimed only to hire highly skilled people whose substitute was not available in the US. How Trump’s H1B Visa plan may eventually benefit India? It is a country’s responsibility to spend its scarce resources and provide its brightest with the best education and opportunities. But, it’s not a country’s duty to facilitate an exodus of their best to other nations. It is a country’s obligation to create a socioeconomic environment where the best can prosper. This is possible only if the best and brightest devote themselves to their growth, which will then improve the nation. It’s a vicious circle. Necessity is the mother of invention, and if our brightest won’t get an opportunity in the US or anywhere else, they will do what’s needed, here, in India. Who stands to lose the most? #h1bvisa Restrictions Can Boost Indian #startup Activities. Who Knows Some May Reach Global Scale. Every Problem Can Be an Opportunity. For last 25 years Indian IT companies used H1B to ship bodies ONLY. Tell me one single innovation or patent? In a single day Trump changed the entire matrimony preference in our country !! #H1B visa ! What are your thoughts on the proposed move by President Trump regarding the H1B Visa? For? Against? Share your thoughts. Previous articleWho Else Wants a Beautiful Alarm Clock That Also Acts as a Multi-Device Charger?